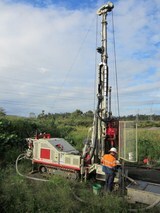 Drillpower QLD and SJ Drilling are specialist in geotechnical drilling with extensive experience in all aspects of ground investigation, geotechnical drilling and sampling. We offer both truck and track mounted drilling rigs, all fully equipped for auger, washbore drilling, air drilling and conventional and wireline coring using NMLC, HQ3, PQ3 or 4C barrels. All drilling rigs are equipped for geotechnical sampling and testing including U50/U75 sampling (including pocket penetrometer or hand vane tests), SPT testing and falling head or packer permeability testing. Our rigs have been designed with safety in mind and have multiple winches to minimise manual handling, fully guarded automatic SPT hammers, rotation guards with lockout and all current mine spec safety features. Our support vehicles are also mine spec with ROPs, IVMS and other industry standard safety features. 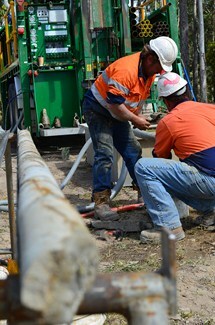 We currently have an Geotechnical Engineer with 24 years experience both in Australia and overseas of supervising geotechnical site investigations from start through to finish. With a background in geology, soil and rock logging to Australian Standards is common practice and having managed projects from new house sites up to new rail lines and large road upgrade projects there is no project too big or too small. We know every site is different and believe previous experience on the ground and in the field is paramount to ensuring a thorough and cost effective project is completed to the client’s highest satisfaction.